When it comes to blockchain, what kind of MSB are you? A lot has changed since IMTC Director Hugo Cuevas-Mohr invited Roger Ver, the so-called Bitcoin Jesus, to the IMTC in Miami in 2012, just five years ago. He debated Arun Sharma professor at the University of Miami School of Business over the validity of Bitcoin. Participants recall that encounter with smiles on their faces remembering Roger Ver screaming to a screen showing live Bitcoin Trades while Dr. Sharma tried reasoning. An IMTC sponsor threatened to withdraw their support as a result for even discussing the cryptocurrency. A lot has changed and The Blockchain Series (TBS) pilot was a testament of sorts. Read along. Today, as 2017 comes to a close, Bloomberg won’t stop airing analyst predictions on Bitcoin futures, and the hype around blockchain, a type of distributed ledger technology (DLT), has been undeniable. Mohr World Consulting plans to officially launch The Blockchain Series (TBS) in 2018 as a result. It will be a seminar designed for business professionals to meet other business professionals already involved in DLT. Of course, every seminar will answer basic questions like: How does blockchain work? Why are people saying blockchain will be as revolutionary as the internet? How does it impact the Financial Sector? And what about the impact on related industries like trade, manufacturing, insurance, and public administration as DLT deliver micropayments and power smart contracts? Although TBS was set to launch next year, many of you noticed it quietly being offered as a pre-conference option on November 28th when registering for IMTC WORLD 2017. IMTC wanted to test the acceptance of its participants to TBS. Despite the fact that no additional promotion was made, a healthy dose of 50 attendees registered for TBS. This turnout surpassed registration for two of the other courses offered that day — a testament to the demand for more information on blockchain. As a co-curator of the pilot’s agenda, the response was quite welcome and provided the necessary engagement to gauge how we structure the TBS format. IMTC is clearly not new to bridging blockchain with the money transfer community, and we’re starting to see a couple of different profiles of IMTC-goers interested in the technology. I share my insights in hopes of hearing where you may fall in this dynamic. The RemTECH Forum – renamed this way after three years of being called the “MTBIT Forum”, was being offered this year at IMTC WORLD 2017’s pre-conference. It was co-hosted by Luis Buenaventura, author of “Reinventing Remittances with Bitcoin and co-founder of Bloom Solutions, and Greta Geankoplis, President of an early-stage blockchain company and the Cybersecurity start-up Stratus who recently received a major award in Luxembourg and international recognition. However, because the Forum’s purpose is to highlight “Remittance Innovations” and blockchain and bitcoin base settlement systems are the dominant remittance innovations influencing money transfers, the great majority of the speakers all came from DLT companies. The forum was still meant to differ from TBS by focusing on ready-for-market blockchain remittance products and their developments in soft-pitches to attendees. TBS, on the other hand, would take a broader and more future-oriented view. One of the promises of DLT and blockchain is to streamline communication between databases, which could lead to a lot more convergence between industries. In particular, the ways in which cross-border payments may engage with other industries outside of money transfers, like banking, insurance, trade and manufacturing, business, and public administration through DLT would be examined. The basics of DLT, how it works, where it’s going, and why MSBs should care would also be addressed. Luis, Greta, Hugo, and I were uncertain about this decision to have two separate sessions, the Forum and the Seminar, but the turn of events on the day of suggests that there is demand from the IMTC audience for both. “Olivia, I think we need to rethink the second half of the day,” Luis came up to me during lunch on the day of pre-conference. Unfortunately, one speaker had to drop out on short notice leaving the RemTECH agenda a bit sparse and both sessions shared one other speaker. Should we combine? By this time of the day, Hugo had already held his Blockchain 101, and I had given my presentation on The State of Blockchain to the TBS audience. At RemTECH, Luis and Yakov Kofner, responsible for SaveonSend and its thought-provoking blog, had debated the merits and limitations of cryptocurrencies in money transfers. A panel of blockchain compliance leaders had provided their perspectives on what MSBs need to know about blockchain regulation. And Lightyear and OKLink, both blockchain remittance companies, had presented their products. Because RemTECH largely revolved around blockchain technologies, all of us organizers agreed it was okay to combine the attendees and speakers of TBS and RemTECH for the second half of the day. How ready is the industry? The energy post-lunch was markedly different than the first half with just the TBS attendees. Conversations moved from clarifying foundational facets of blockchain benefits and exploring different use cases to debates on whether bitcoin remittances can meet compliance requirements. It moved from big picture forecasting to specifics and implementation today. Attendees noticed. Those who signed up for TBS reportedly did not appreciate the latter-day shift. They critiqued that there was too much focus on using bitcoin and other cryptocurrencies for remittances and not enough on the applications of blockchain technology on the whole. They wanted to talk about new credit score mechanisms, Nasdaq’s use of blockchain, ICOs, and why the heck is blockchain getting so much attention? In essence, they wanted to get a lay of the blockchain land as they decide what they should do with their business — and this seemed to go beyond interest in money transfers. Although unplanned, the decision to combine The Blockchain Series and RemTECH provided some telling A/B testing that can guide the future of how IMTC engages our audience on blockchain and innovation. The response seems to confirm that there is a need for two blockchain courses with attendees falling into two camps. These attendees are likely in their early-stage of blockchain research still getting the basics down. Something may be telling them they need to pay attention to blockchain but are still unsure why. Or they’re familiar with cryptocurrencies and blockchain in remittances, but want to better understand other applications and the state of blockchain overall. They are searching for the whitespace opportunity that they can start planning for in a supposed blockchain world. Many of the potentials for blockchain in money transfers relies on the progress of identity on the blockchain, government regulations, and bank cooperation so getting up-to-date on the status of these areas are of importance to their decision-making. In terms of their blockchain journey, these attendees are in exploration and roadmapping stage. They are surveying the big picture and are interested to hear what other industries are doing, how to plan for blockchain, and where international payments may sit in the blockchain ecosystem. If products are still in pilot phase, this is less of a concern than wrapping their heads around the direction of blockchain. How will blockchain change what is possible for cross-border real estate transactions, billpay, lending, trade financing, and manufacturing? What does the role of cross-border payments have in this world? How does that affect identity, credit scores, and compliance? What are the frictions to making any of these possibilities happen? Is an ICO a good idea for my business? Unwrapping how new value-added services in peripheral industries could open up new business models for undiscovered streams of revenue are of interest. Possible pilot partnerships across industries could be in the cards. 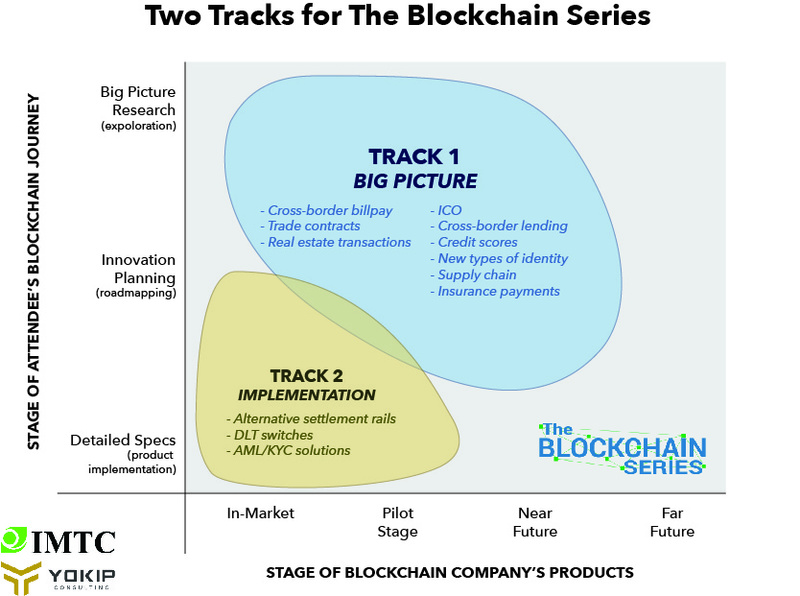 Those on track 2 are past the DLT exploration phase, may still be roadmapping, but have a high-level of certainty that they want to start putting transactions on the blockchain. They are serious about implementation and are doing their product research. This MSB may be fed up with de-risking, witnessing increased demand for crypto in their part of the world, or their regulators may have passed new blockchain-friendly legislation that is compelling them to act. The MSB also might be committed to a blockchain strategy and has recognized the first step is getting transfers on blockchain. Whether their interests are driven by immediate needs or they’re planning for the future, they want to know the details of putting their transactions on DLT. These attendees are looking for in-market solutions and are ready to make a deal. At the moment, alternative settlement rails using crypto and virtual currencies, instant and more accurate transaction messaging systems, and AML and KYC tools for blockchain transactions are commercial. Understanding the pros and cons of these different products, their usability, customer service, price structures, and corridor availability are of priority. These attendees want to know how these product factors affect their cash flow management, operations, compliance, and taxes. “Your presentation was very good, but you didn’t tell me what to do!” An exacerbated attendee from TBS pilot explained to me at the Eden Roc bar. 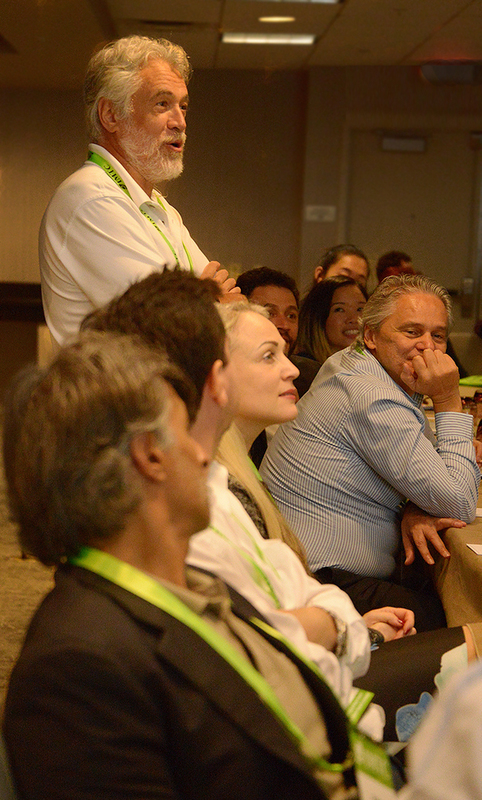 He was one of the participants who also was less than enthralled with the attention bitcoin got in our course. The answer depends on your business. Blockchain is just a technology that needs to answer problems specific to your company. What are your goals for the next 2 to 5 to 10 years? Are you struggling with customer acquisition? How much has de-risking affected your business? How much has compliance and competition eaten into your margins year-over-year? What do your customers care about most? When I work with my MSB clients, these are just a handful of concerns we evaluate to identify which set of blockchain solutions may be relevant. From there, local regulatory climates, IT resources, flow of funds, available blockchain programs and networks in your region must be considered. This process is to match them with the appropriate products or partnerships and zero in on their innovation roadmap. Conducting pilots, measuring the appropriate KPIs, making projections, and determining if its worth continuing follows. As IMTC is ultimately a place of business, I wondered if there was more we could do to support both MSBs interested in blockchain and blockchain companies. Would exercises that focused on developing your business’ blockchain strategy be of interest? For those who are ready to implement, what do you think of having a day where you could demo available blockchain products all at once? Would you participate in focus groups with blockchain companies to have the opportunity to influence the direction of their solutions? 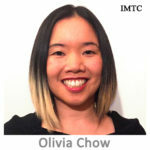 The two types of blockchain interests present at IMTC this year suggest there is a need for both a wide and narrow blockchain course. However, the feedback around focusing on action also struck a chord. And perhaps we just need to be better about connecting the dots to address both interests in one course. I didn’t get to speak with everyone at the conference nor even all of you who participated in our TBS pilot. So we at IMTC are very interested to hear from the community what you’d like to see from The Blockchain Series. Below is a link to a quick three question poll that will further help us and that we’ll post results on in our next newsletter. The poll is anonymous as to get the most responses, but if you had further comments, questions, or concerns, you can reach me or Hugo. Look forward to hearing from you and am available for further blockchain business consultation. I plan on posting more articles diving deeper into blockchain and MSBs and welcome any requests there of as well. Olivia has spent her career helping companies innovate and break into new markets by working across industries and departments to find whitespace opportunities. Lately, as CEO of Yokip Consulting [http://yokipconsulting.com/] she’s been linking blockchain and the money transfer industry seeing this bridge as fundamental to the future.